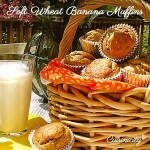 These wonderfully moist muffins are very easy to make because they are a “throw-everything in one bowl operation”! I use whole wheat pastry flour which is milled from soft wheat rather than the hard red wheat in regular whole wheat flour (here is one I like) which is perfect for these muffins because it is light and airy yet still rich in fiber. They are also low in sugar and you’ll see how I did it in my cuisinicity tip! 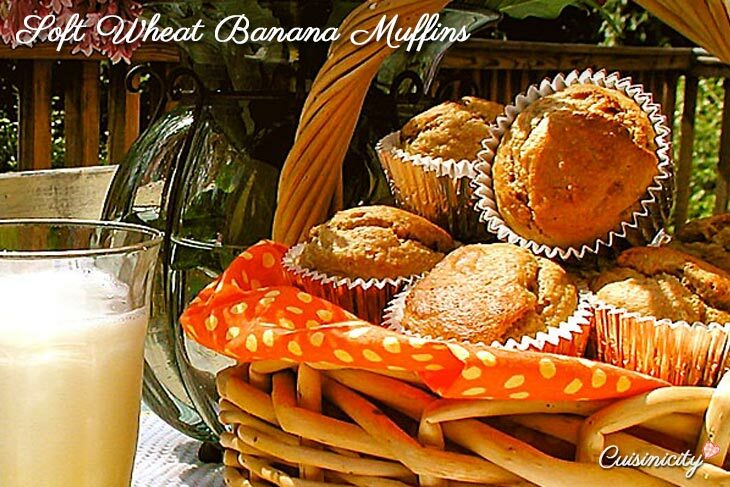 Cuisinicity Tip: I use fat-free powdered milk as a source of natural sugar found in lactose as well as the natural sweetness of the ripe bananas to cut down on regular added sugar--Can you believe ¼ cup brown sugar for 12 muffins? Place bananas, egg, brown sugar, powdered milk, ground almonds and oil in the bowl of an electric mixer and beat until well blended. Add the flour and baking powder to the batter and start the mixer on low speed, adding in the almond milk slowly until well blended. Place 12 foil-baking cups on a cookie sheet (you can also use a muffin baking pan lined with paper liners) and spoon the batter in each so that each is ⅔ full. Bake for 15-20 minutes, until golden !! Hi Catherine, I just popped these in the oven. As you know I do, I’ve made a few changes. I used powdered coconut milk & put chocolate chips in half the batter, to have plain & choc. chip. Quick question, I notice you don’t say to pack the brown sugar, do you? I have another question Catherine. Do you think you could use coconut oil instead of the canola? I am so on the fence about canola even when I buy the organic , non GMO, cold pressed kind. Barbara I prefer to use canola oil. It’s a good source of monounsaturated fats, and it is the richest cooking-oil source of alpha-linolenic acid which has been linked to heart health. Here are a couple articles that I agree with and that give it more justice than I can in a few words here: I hope this helps! I think that may work–what a great idea! Meanwhile, I have a pumpkin Chocolate Chip recipe that I was saving for next month for Pumpkin day, but I will go publish it right now for you! I think you are going to love it!!! Thank you Dean, I LOVE “the greatest”!!! YAY! !